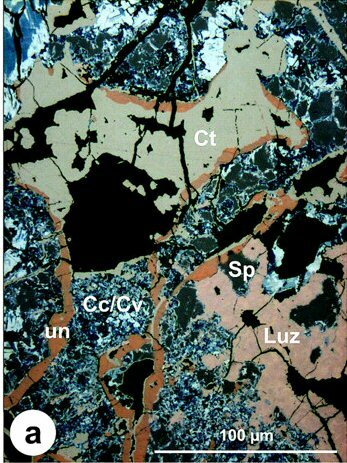 Comments: Catamarcaite (Ct) in contact with luzonite (Luz), unnamed Cu8Fe2ZnGe2S12 (un), sphalerite (Sp) and fine-grained chalcocite - covellite (Cc/Cv). (CanMin v44:1481). Location: Bornite-rich ore from old dumps near the La Rosario vein, Capillitas epithermal deposit, Catamarca Province, Argentina.